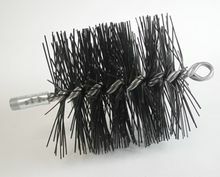 Professional's Choice Chimney Brushes are the moderately priced chimney brush that are rugged enough to stand the everyday demands of the busy sweep. The single spiral 0.177 diameter spindle designed with a heavy-duty plated 3/8" thread double swaged fitting produces a brush that will take abuse and be ready for more. Designed for removing soot from fossil fuels in coal, oil or gas flues where the acids may deteriorate steel bristles. .075 poly filaments are 7" of fill.